When the Excelsior Henderson Motorcycle Company factory in Belle Plaine, Minnesota was forced to close, many dedicated owners like ourselves were unsure if we would be able to keep our bikes on the road. Mechanical problems were beginning to occur and the availability of parts was a real concern. The original dealers were running away from us and there were no knowledgeable technicians available. We decided that if we wanted to keep our bikes, it was up to us to source the parts and learn hands-on what problems the bikes developed. We were both in an excellent position to do this. Between us we had 55 years of experience in the parts and repair of automobiles and motorcycles. We began by buying out dealer inventories and parts still held by the factory's original suppliers. Later we were able to access the original factory inventory when it was purchased by Swift. What started as a way to have parts for ourselves and friends grew as more owners learned about us. The shop started filling up as people learned about our repair program and now we remain the only shop that specializes exclusively in the Excelsior-Henderson motorcycle. What a long, strange trip it has been. Twelve years of servicing and repairing only one model of bike has made us experts on what the Super X was, is and can be. We pioneered the the idea of offering an upgrade package that addresses and anticipates our bike's mechanical issues with the Super X Solution. Developing ways to insure better reliability and performance led to the Super X Performance Solution. Along with Tim, we helped to develop the SuperXTune. We are always looking for ways to improve the bike without compromising the original styling and engineering. Our goal has always been to keep these wonderful machines on the road and ridden regularly. We can be relied upon to do this right. We work smart and we work hard to keep repair costs reasonable without sacrificing quality. Your patronage insures that we can continue that goal and all be a part of living history as the Excelsior Henderson story continues. Thanks for the support. It is about the bikes folks. Be sure to visit Excelsior-Henderson.com. 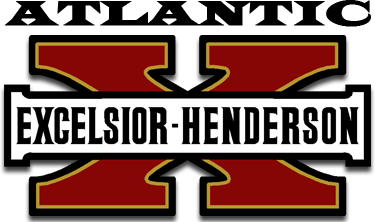 Dan Hanlon has revived the old website and has the authentic history of Excelsior Henderson available to all. We encourage you to register your bike and participate in the forums.